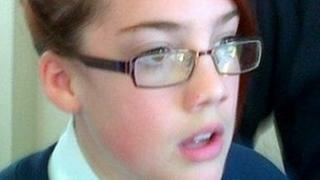 Police have blamed "human error" for the failure to find a body in Tia Sharp's grandmother's house. Tia was reported missing on 3 August and a body was found at the house in New Addington, Croydon, on Friday after three previous unsuccessful searches. Scotland Yard apologised to Tia's mother Natalie and said the body should have been found on Sunday. Tia's grandmother Christine Sharp, 46, and her partner Stuart Hazell, 37, have been arrested on suspicion of murder. A 39-year-old man has also been arrested on suspicion of assisting an offender. The first search of the house took place on the day Tia went missing. Police said it was an "initial examination" of the home rather than a full search. The second visit, on Sunday, took two hours and was carried out in the presence of the occupiers. A police review has concluded human error during this examination was responsible for the failure to find the body. Officers had searched the area where the body was eventually found without discovering anything. The third visit, on Thursday, saw a sniffer dog deployed, again without finding a body. It was only a full week after Tia was reported missing that police discovered the body during their fourth search on Friday. Area Commander Neil Basu said: "An early review has been conducted and it is now clear that human error delayed the discovery of the body within the house. "We have apologised to Tia's mother that our procedures did not lead to the discovery of the body on this [the second] search. "A continuing review and examination of our search processes will be undertaken to ensure such a failing is not repeated." BBC Home Affairs Correspondent Danny Shaw tweeted: "I can't ever remember a time when Met admitted a serious mistake so quickly and made immediate apology. But how did it happen?" A post-mortem examination of the body has begun.